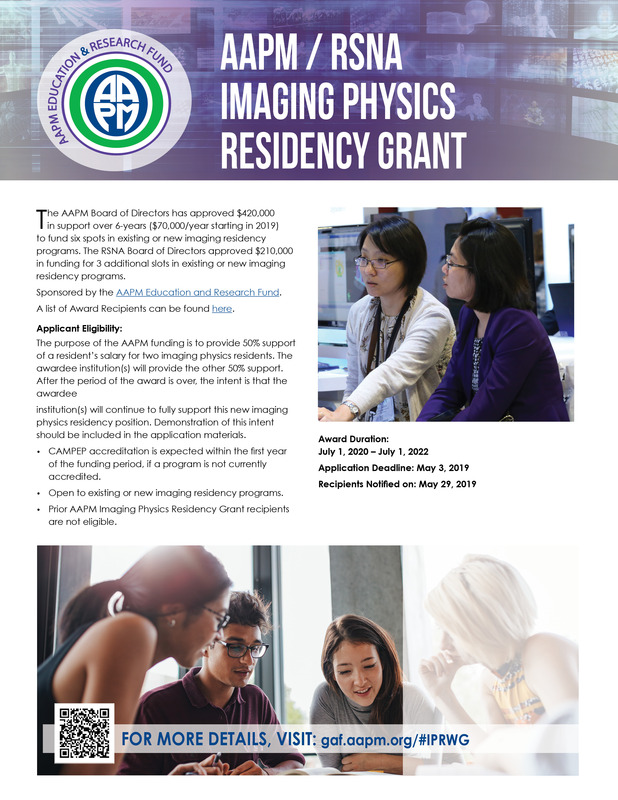 AAPM / RSNA Imaging Physics Residency Grant: On November 29, 2017, the AAPM Board of Directors approved $140,000 in funding for two new imaging physics residency positions, in diagnostic, diagnostic with a nuclear medicine option, or nuclear medicine. With this funding, the selected institution(s) will receive $35,000 per year for two years as matching support for one resident. *Program Update* The AAPM Board of Directors has approved $420,000 in support over 6-years ($70,000/year starting in 2019) to fund six spots in existing or new imaging residency programs. The RSNA Board of Directors approved $210,000 in funding for 3 additional slots in existing or new imaging residency programs. Sponsored by the AAPM Education Council through the AAPM Education & Research Fund. A list of Award Recipients can be found here. The purpose of the AAPM funding is to provide 50% support of a resident's salary for two imaging physics residents. The awardee institution(s) will provide the other 50% support. After the period of the award is over, the intent is that the awardee institution(s) will continue to fully support this new imaging physics residency position. Demonstration of this intent should be included in the application materials. CAMPEP accreditation is expected within the first year of the funding period, if a program is not currently accredited. Open to existing or new imaging residency programs. 1st priority – New programs (hence new slots), no previous funding from any AAPM program. A new program is defined as one that has applied for CAMPEP accreditation after January 1, 2018, or has not yet applied for CAMPEP accreditation. 2nd priority – Existing program but with new slots, no previous funding from any AAPM program. A new slot is defined as one that has been created or filled after January 1, 2018. 3rd priority - Existing program but with new slots, has had previous funding from any AAPM program. A new slot is defined as one that has been created or filled after January 1, 2018. 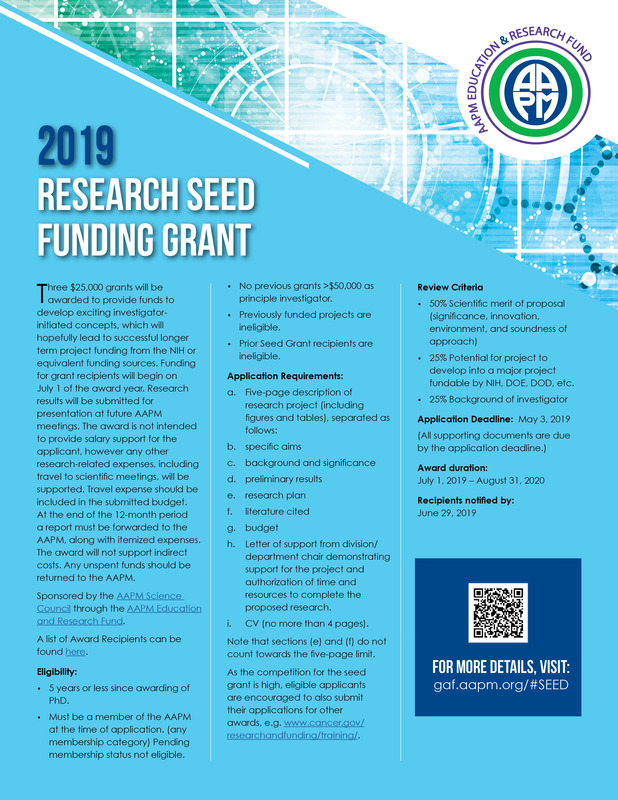 Research Seed Funding Grant: Three $25,000 grants will be awarded to provide funds to develop exciting investigator-initiated concepts, which will hopefully lead to successful longer term project funding from the NIH or equivalent funding sources. Funding for grant recipients will begin on July 1 of the award year. Research results will be submitted for presentation at future AAPM meetings. The award is not intended to provide salary support for the applicant, however any other research-related expenses, including travel to scientific meetings, will be supported. Travel expense should be included in the submitted budget. At the end of the 12-month period a report must be forwarded to the AAPM, along with itemized expenses. The award will not support indirect costs. Any unspent funds should be returned to AAPM. Sponsored by the AAPM Science Council through the AAPM Education & Research Fund. Must be a member of the AAPM at the time of application. (any membership category) Pending membership status not eligible. No previous grants >$50,000 as principle investigator. Previously funded projects are ineligible. Prior Seed Grant recipients are ineligible. Letter of support from division/department chair demonstrating support for the project and authorization of time and resources to complete the proposed research. CV (no more than 4 pages). Note that sections (e), (f), (g) and (h) do not count towards the five-page limit. Click to apply below. Click below to complete the online application. Combine all files into ONE PDF and upload. As the competition for the seed grant is high, eligible applicants are encouraged to also submit their applications for other awards, e.g. http://www.cancer.gov/researchandfunding/training/. 25% Potential for project to develop into a major project fundable by NIH, DOE, DOD, etc. (All supporting documents are due by the application deadline.) You must log onto the AAPM website to view the apply button. 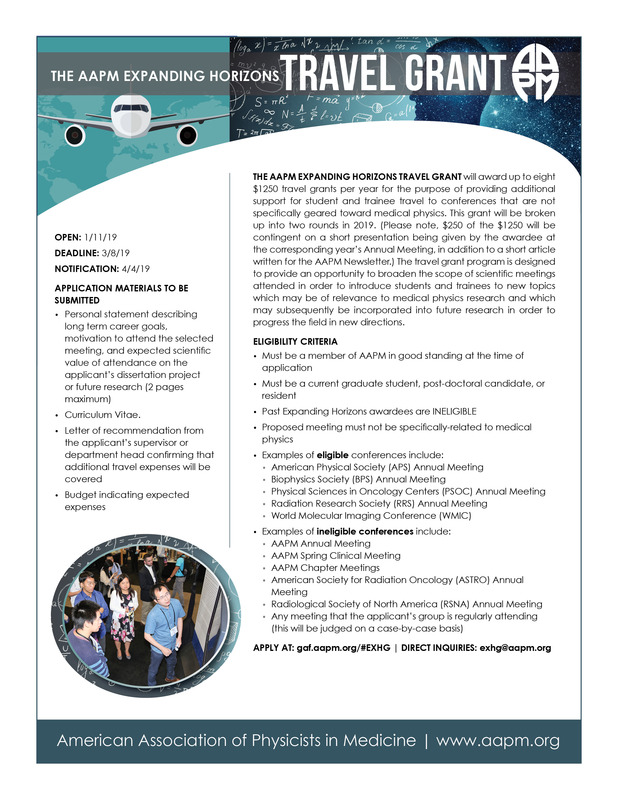 The AAPM Expanding Horizons Travel Grant: Will award up to eight $1250 travel grants per year for the purpose of providing additional support for student and trainee travel to conferences that are not specifically geared toward medical physics. This grant will be broken up into two rounds in 2019. (Please note, $250 of the $1250 will be contingent on a short presentation being given by the awardee at the corresponding year’s Annual Meeting, in addition to a short article written for the AAPM Newsletter.) The travel grant program is designed to provide an opportunity to broaden the scope of scientific meetings attended in order to introduce students and trainees to new topics which may be of relevance to medical physics research and which may subsequently be incorporated into future research in order to progress the field in new directions. Must be a member of the AAPM in good standing at the time of application. Must be a current graduate student, post-doctoral candidate, or resident. Proposed meeting must not be specifically-related to medical physics. Any meeting that the applicant’s group is regularly attending, this will be judged on a case-by-case basis. Personal statement describing long term career goals, motivation to attend the selected meeting, and expected scientific value of attendance on the applicant’s dissertation project or future research (2 pages maximum). Letter of recommendation from the applicant’s supervisor or department head confirming that additional travel expenses will be covered. Awardees will be expected to submit a brief (approximately 1 page) report of their experience to be included in the AAPM Newsletter. This should include a general introduction to the meeting that was attended and a description of approximately three presentations that the applicant feels could have an impact in medical physics research. Additionally awardees might be expected to create an eposter for the following AAPM Annual Meeting describing their experience. Awardees are expected to serve as reviewers for a future round of applications to the travel grants. They can therefore use their experience to guide the future direction of the program. AAPM/ERF-SNMMI Nuclear Medicine Residency Grant: The AAPM Board of Directors has approved the expenditure of $70,000 (25% support) over the next 2 years to fund 2 new nuclear medicine residency programs in collaboration with SNMMI. ERF-SNMMI has agreed to provide $70,000 (25% support) in funding. Each funded institution will provide $140,000 (50% support). This could be a 2+1 program. Programs that have submitted an application for accreditation nuclear medicine physics. Programs that will commit to submitting an application for CAMPEP accreditation in a timely fashion so that CAMPEP may review the application before the first resident completes the program. Programs should allow 6-9 months for CAMPEP review. These scenarios need not be in place at the time of the application but are required to receive the award. The funding is granted to the institution. An individual need not be named at the time of application. The funds are held by AAPM until the institution has an individual to fill the training position. This grant pays for direct support (Salary and fringe benefits ) of the resident. It does not pay institutional overhead costs or indirect costs. A summary report and an accounting of funds will be requested at the halfway point and upon completion of the training period. The final report is due within 60 days after completion of the specified training period. Commitment to nuclear medicine training. Facilities relative to nuclear medicine training. Quality of the training program based upon the description of the training rotations, didactic content and quality of training partner if used. The AAPM Science Council Associates Mentorship Program: This program has been established to recognize and cultivate outstanding researchers at an early stage in their careers, with the goal of promoting a long-term commitment to science within AAPM. The program uses the process of ‘shadowing’ to integrate the Associates into the scientific activities of the organization. The program will include six Associates, each assigned to shadow one member from the AAPM Science Council, Research Committee, Therapy Physics Committee, Imaging Physics Committee, or Technology Assessment Committee. The Associate would participate in selected meetings of the Mentor’s Committee and would join and contribute to one Task Group (chosen with input from the mentor). The Associate would shadow AAPM-related activities of the mentor, including committee phone calls, abstract review, Young Investigator judging, committee activities at the Annual Meeting, etc. 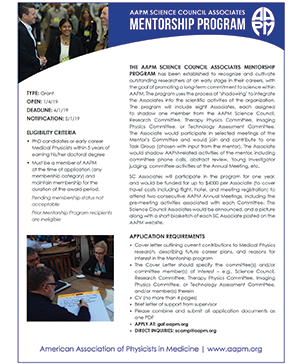 SC Associates will participate in the program for one year, and would be funded for up to $4000 per Associate (to cover travel costs including flight, hotel, and meeting registration) to attend two consecutive AAPM Annual Meetings, including the pre-meeting activities associated with each Committee. The Science Council Associates would be announced, and a picture along with a short biosketch of each SC Associate posted on the AAPM website. PhD candidates or early career Medical Physicists within 5 years of earning his / her doctoral degree. Must be a member of AAPM at the time of application (any membership category) and maintain membership for the duration of the award period. Pending membership status not acceptable. Prior Mentorship Program recipients are ineligible. The Science Council of the AAPM has established a travel award to support the attendance of 1 to 2 early-career, research-oriented AAPM members to participate in the 10th Annual Coalition for Imaging and Bioengineering Research (CIBR) Medical Imaging Technology Showcase, which is sponsored by the Academy of Radiology and Biomedical Imaging Research (the Academy). The Academy hosts the annual Medical Imaging Technology Showcase, an event in a senate or house office building on Capitol Hill, to educate members of Congress and their staff about the impact of imaging technology. 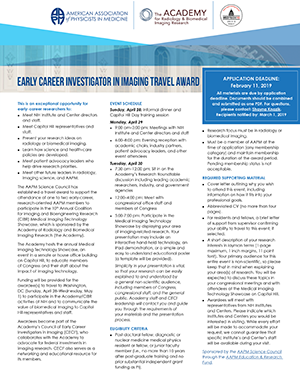 Funding will be provided for the awardee(s) to travel to Washington, DC (Sunday, April 28 arrival/Wednesday, May 1st departure) to participate in the Academy/CIBR activities at NIH and to communicate the value of biomedical imaging to Capitol Hill representatives and staff. Awardees become part of the Academy's Council of Early Career Investigators in Imaging (CECI2), who collaborates with the Academy to advocate for federal investments in imaging research. CECI2 also serves as a networking and educational resource for its members. Monday, April 29: Meetings with NIH Institute and Center directors and staff (~ 9 am – 3 pm) and evening reception with academic chairs, industry partners, patient advocacy leaders, and other event attendees (~ 6 pm – 8 pm). Tuesday, April 30: Sit in on the Academy’s Research Roundtable discussion including leading academic researchers, industry and government agencies (7:30-12noon) In the afternoon you will meet with congressional office staff and members of Congress (12-4pm) and participate in the Medical Imaging Technology Showcase (5-7pm) by displaying your area of imaging-related research. Your presentation may include an interactive hand-held technology, an iPad demonstration, or a simple and easy to understand educational poster (a template will be provided). Simplicity in your presentation is vital, so that your research can be easily explained to and understood by a general non-scientific audience, including members of Congress, congressional staff, and the general public. Academy staff and CECI leadership will contact you and guide you through the requirements of your materials and the presentation process. 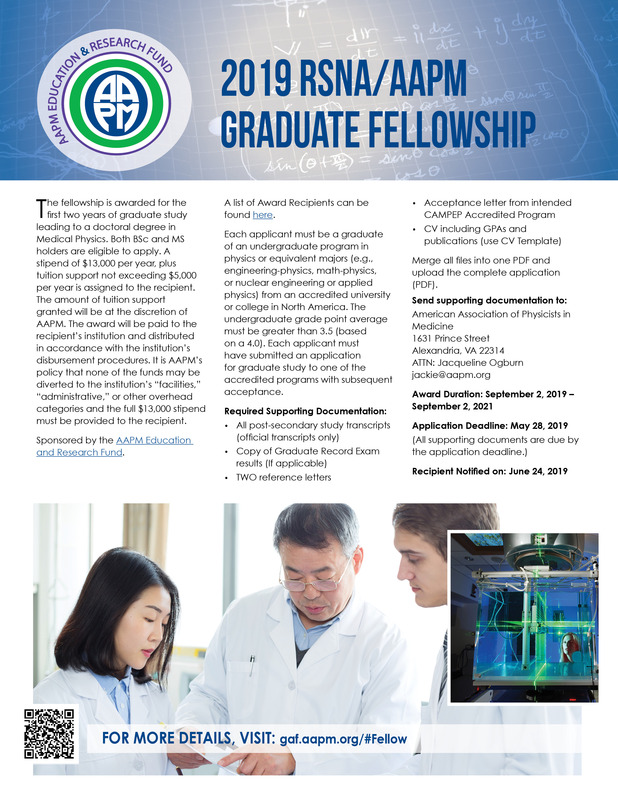 Post-doctoral fellow, diagnostic or nuclear medicine medical physics resident or fellow, or junior faculty member (i.e., no more than 10 years after post-graduate training and no prior substantial independent grant funding as PI). Research focus must be in radiology or biomedical imaging. Must be a member of AAPM at the time of application (any membership category) and maintain membership for the duration of the award period. Pending membership status is not acceptable. Cover letter outlining why you wish to attend this event, including information on how it fits into your professional goals. Abbreviated CV (no more than 4 pages). For residents and fellows, a brief letter of support from supervisor confirming your ability to travel to this event, if selected. A short description of your research interests in layman terms (1 page maximum, 1 inch margins, 11 point font). Your primary audience for this entire event is non-scientific, so please keep that in mind when explaining your area(s) of research. You will be expected to discuss these topics in your congressional meetings and with attendees at the Medical Imaging Technology Showcase on Capitol Hill. Awardees will meet with representatives from NIH Institutes and Centers. Please indicate which Institutes and Centers you would be interested in visiting. While every effort will be made to accommodate your request, we cannot guarantee that specific Institute’s and Center’s staff will be available during your visit. All materials are due by application deadline. Documents should be combined and submitted as one PDF. ASTRO-AAPM Physics Resident/Post-Doctoral Fellow Seed Grant: AAPM and the American Society of Radiation Oncology (ASTRO) are happy to announce a jointly funded research seed grant for Medical Physics Residents and Post-Doctoral Fellows. The goal of the joint seed grant is to advance the field of radiation oncology in novel ways through the support of early-career scientists involved in radiation oncology physics-related research. With this jointly supported grant, both societies aim to help support the next generation of researchers in the field of radiation oncology. One grant of up to $25,000 will be awarded. The start date for the 2019 award will be July 1, 2019. Sponsored by the AAPM Science Council through the AAPM Education & Research Fund and the American Society of Radiation Oncology (ASTRO). Must show a commitment to a career focusing on physics-related research relevant to radiation oncology. Must work at an institution with a well-established research and clinical career development program and qualified faculty in physics and radiation oncology to serve as a mentor. Must be a physics resident or post-doctoral fellow, and your institution must be willing to commit 75% of your time to research for at least one year. Application Instructions: Applications for the ASTRO-AAPM Physics Resident/Post-Doctoral Fellow Seed Grant must be received by March 4th, 2019 at 11:59 PM Eastern time. All applications must be submitted through ASTRO's ProposalCentral. RSNA/AAPM Graduate Fellowship: The fellowship is awarded for the first two years of graduate study leading to a doctoral degree in Medical Physics (Ph.D. or DMP). Both BSc. and MS holders are eligible to apply. Applicants must be a member of the AAPM at the time of application, (any membership category). Pending membership status not eligible. A stipend of $13,000 per year, plus tuition support not exceeding $5,000 per year is assigned to the recipient. The amount of tuition support granted will be at the discretion of AAPM. The award will be paid to the recipient’s institution and distributed in accordance with the institution’s disbursement procedures. It is AAPM’s policy that none of the funds may be diverted to the institution’s “facilities”, “administrative”, or other overhead categories and the full $13,000 stipend must be provided to the recipient. Sponsored by the AAPM Education & Research Fund. Each applicant must be a graduate of an undergraduate program in physics or equivalent majors (e.g. engineering-physics, math-physics, or nuclear engineering or applied physics) from an accredited university or college in North America. The undergraduate grade point average must be greater than 3.5 (Based on a 4.0). Each applicant must have submitted an application for graduate study to one of the CAMPEP accredited programs with subsequent acceptance. Click below to complete the online application, download and complete the application form. Merge all files, excluding official transcript and reference letters, into ONE PDF and upload. 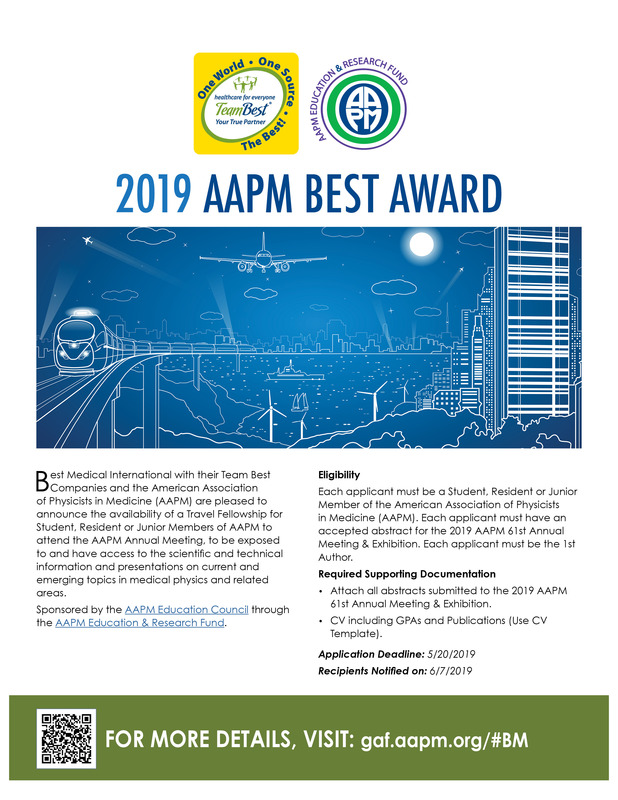 AAPM BEST Award: BEST Medical will provide five (5) fellowships in the amount of one thousand dollars ($1,000) each, to be used for travel, food and lodging expenses to attend the 2019 AAPM 61st Annual Meeting & Exhibition. AAPM will provide complimentary Annual Meeting registration for each recipient, including social functions. BEST Medical will also provide a plaque for each of the 5 fellowship recipients to be presented by BEST Medical during the AAPM Annual Meeting with photographs of the presentations. BEST Medical and AAPM will have the right to use these photographs, and indicate each recipient's name and identifying information in recognizing the recipient’s achievement of being selected for the fellowship. first author on an accepted abstract for the 2019 AAPM 61st Annual Meeting & Exhibition. Attach all abstracts submitted to the 2019 AAPM 61st Annual Meeting & Exhibition. Download and complete the AAPM BEST Award application. Merge all files into one PDF and upload the completed application (PDF). THE APPLICATION DEADLINE SHOWN ABOVE IS CURRENT. You must log onto the AAPM website to access the apply button. 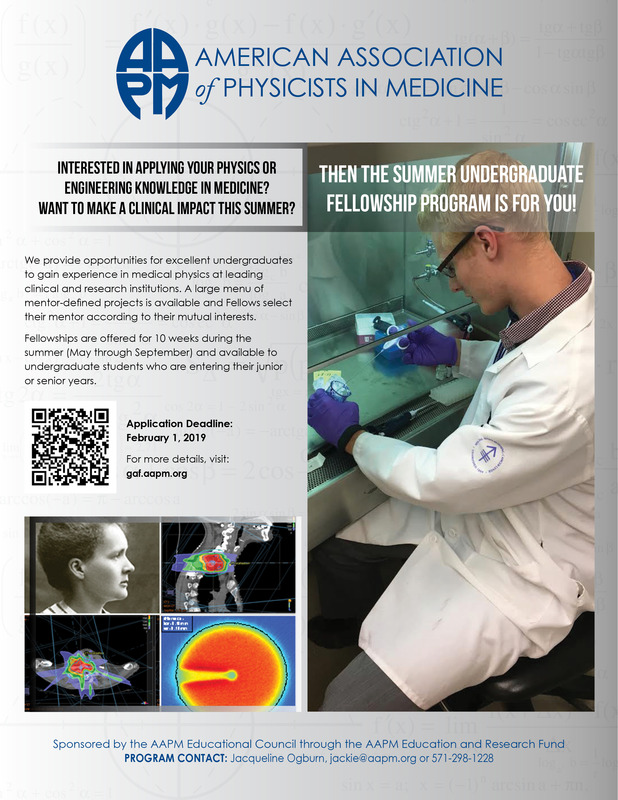 Summer Undergraduate Fellowship Program: The American Association of Physicists in Medicine (AAPM) Summer Undergraduate Fellowship Program is 10 week summer program designed to provide opportunities for undergraduate university students to gain experience in medical physics by performing research in a medical physics laboratory or assisting with clinical service at a clinical facility. The term of the fellowship is May - September. The mentor and Fellow will determine the exact 10 week schedule. In this program, AAPM serves as a clearinghouse to match exceptional students with exceptional medical physicists, many who are faculty at leading research centers. Students participating in the program are placed into summer positions that are consistent with their interest. Students are selected for the program on a competitive basis to be an AAPM summer fellow. Each summer fellow receives a $5,500 stipend from AAPM. The stipend is based upon an expectation of 40-hour per week effort for 10 weeks. Summer Undergraduate Fellowship Award Winners History. Each student applicant shall have completed at least 2 years of their undergraduate studies, but shall not have graduated, i.e. rank of junior or senior. Students with graduation date of May 2019 are not eligible. Applicants shall have declared a major or be eligible to declare a major in physics, engineering, or other science, which requires mathematics at least through differential equations, modern physics/quantum mechanics, electricity and magnetism or equivalent courses in engineering sciences. Summer Undergraduate Fellowships are restricted to U.S. citizens, Canadian citizens and Permanent residents of the U.S.
Construct a 1-page typewritten self-statement (font with Times New Roman, 11 pts minimum, and 1” margin space all around). It should include a brief academic history, a statement of how one became knowledgeable of medical physics, and one’s future goals upon graduation. Combine the Application and Self Statement into one PDF and upload online. DO NOT Mail the application and self statement. 2 signed Letters of Reference can sent via email to Jackie@aapm.org or mailed to the address below. Official transcripts can be sent via email to Jackie@aapm.org or mailed to the address below. (All supporting documents are due by the application deadline (EDT). Applicants are eligible to apply to only one of the summer fellowship programs. Click the apply button to obtain the Application Template. DREAM - Diversity Recruitment through Education and Mentoring Program: The American Association of Physicists in Medicine (AAPM) Diversity Recruitment through Education and Mentoring Program "DREAM" is a 10 week summer program designed to increase the number of underrepresented groups in medical physics by creating new opportunities, outreach and mentoring geared towards diversity recruitment of undergraduate students in the field of medical physics. Students participating in the program are placed into summer positions that are consistent with their interest. Students are selected for the program on a competitive basis to be a DREAM fellow. 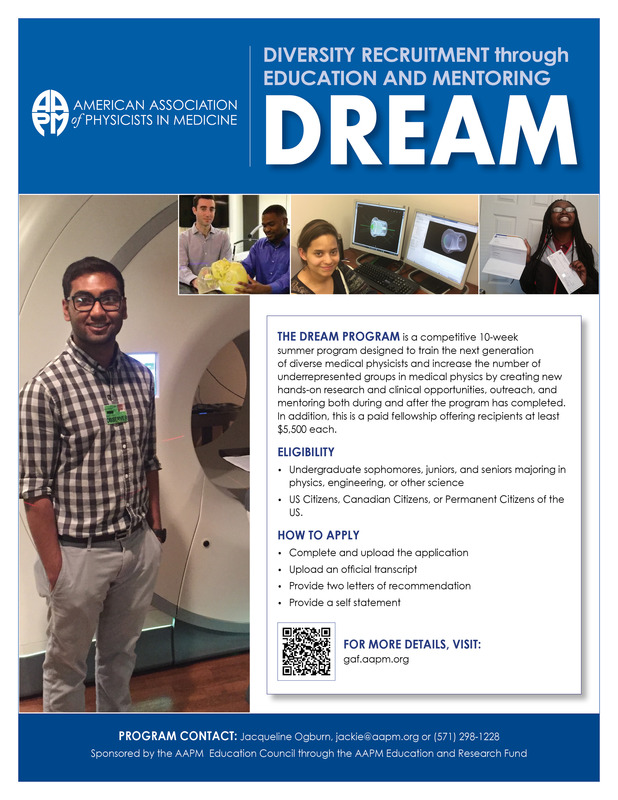 Each DREAM fellow receives a $5,500 stipend from AAPM. The stipend is based upon an expectation of 40-hour per week effort for 10 weeks. The fellowship will be for a period of 10 weeks during the summer academic period (May to September), which is mutually suitable to the mentor and fellow. DREAM (formerly known as Minority Undergraduate Summer Experience Program) Award Winners History. Each student applicant shall have completed at least 2 years of their undergraduate studies, but shall not have graduated, i.e. rank of sophomore, junior or senior. Students with a graduation date of May 2019 are not eligible. Applicants shall have declared a major or be eligible to declare a major in physics, engineering, or other science, which requires mathematics at least through differential equations, modern physics/quantum mechanics, electricity and magnetism or equivalent courses in engineering sciences. DREAM Fellowships are restricted to U.S. citizens, Canadian citizens and Permanent residents of the U.S. Send Official transcripts via email to Jackie@aapm.org or mailed to the address below.